Wow! Can you believe it has been a year since Cassandra and I decided to start blogging?! I have loved sharing my life with you guys and giving you a peek at what a southern Indiana classroom does! I have also learned so much from my bloggy buddies. I have even brought blogging into my classroom!! Well, to celebrate, we have decided to have a little giveaway! Enter to win $10 to my Teachers Pay Teachers store and your choice of 3 Tiny Task Cards from Cassandra's store, Primary Scribbles! Thanks for making this an awesome year!! 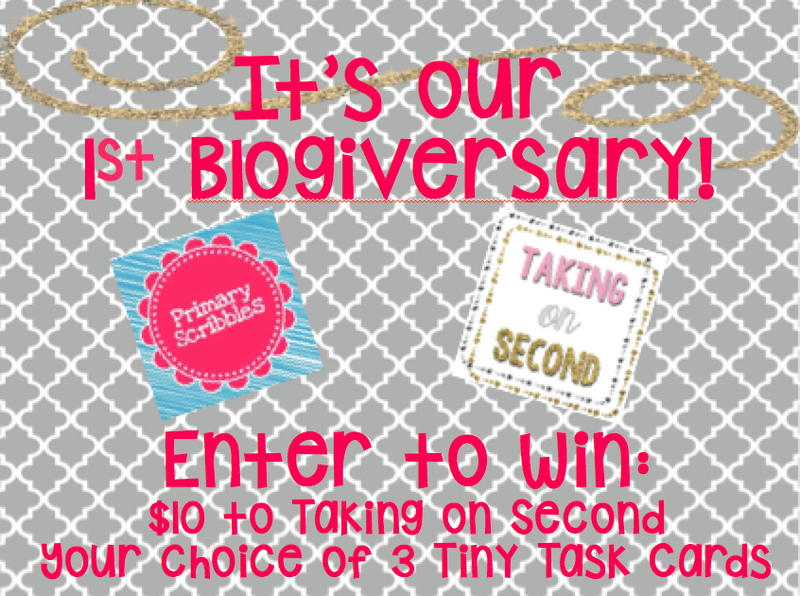 Happy Blogiversary!!! So exciting! Congratulations and thank you for the giveaway!